“I’m looking for my daddy! Where’s my daddy?” the character “Brown Rice” says while sauntering around the stage. She pulls a reluctant white man in the audience front row up from his seat. “Join us — for a taste of Asia!” say the four other Asian-American women on stage at Chelsea Theatre in New York. They’re dressed in plaid schoolgirl skirts and Sailor Moon-style bows fitted on white shirts. They usher the man to a chair and blindfold him. A slideshow of vaguely Asian and “zen” stock images plays on the projector: intricate lines drawn in the sand, two monks walking in a garden, a fox closing its eyes in a meadow. Then, a mellow cover of Taylor Swift’s “Shake It Off” begins — but in Japanese. This is AzN PoP! 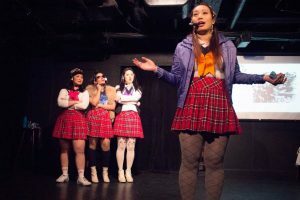 — the first all-Asian-American and female comedy group to perform at the Upright Citizens Brigade, a theater and comedy training ground that claims Amy Poehler as one of its founders and that includes well-known alumni such as Aziz Ansari and Kate McKinnon. The five members of AzN PoP! each represent a different Asian country: Japan, India, the Philippines, South Korea and China. Through song and satire, their material skewers the Asian-American experience and takes sharp digs at stereotypes and whitewashing — though disarmingly. One song, titled “White Guys,” parodies the stereotype of Asian women preferring to date white men, as the group’s members croon about their respective loves for famous white men such as Guy Fieri and Joseph Stalin. In “That’s Me,” they cheerfully critique the prevalence of the whitewashing of Asian characters in Hollywood, like when white actor Emma Stone came under fire for playing a half-Asian character in “Aloha,” among other recent casting decisions that inspired the viral Twitter hashtag #whitewashedOUT. Anna Suzuki had mused about the idea of a Japanese Pop-inspired comedy routine for years. After connecting with the four other women in the show through mutual friends, AzN PoP! was born, taking inspiration from both the Japanese and Korean Pop music industries, called J-Pop and K-Pop, which have become international phenomenons over the last two decades, with their trademark hyper-exuberant song and dance. K-Pop in particular has attracted international fans for decades, but the genre gained greater recognition in the West in 2012, when the artist PSY’s music video for the song “Gangnam Style” went viral, breaking the record for most-viewed video ever on YouTube with over 2.9 billion views (until Wiz Khalifa’s “See You Again” music video seized the top spot on July 10 this year). K-Pop’s influence on the group is evident as the comedians bounce around on stage, weaving song and dance with satire, effervescence tinged with acid. AzN PoP! performing at Upright Citizens Brigade Theatre Chelsea. Left to right: Angel Yau, Anna Suzuki, Maya Deshmukh, Ann Marie Yoo and Iliana Inocencio. While the members say that they’ve seen audiences of all races enjoy the show, they’ve heard from Asian audience members who see their performance as cathartic. Biana Consunji, a 32-year-old immigrant from the Philippines, attended the recent show with her partner Evan Engel, who is white. “I thought it was hilarious,” Consunji told NewsHour about the “White Guys” song. “A lot of my friends give [my partner] trouble” for being a white man dating an Asian woman. Consunji also found herself connecting with their depictions of the immigrant experience. With that line, the group bluntly calls out what members of AzN PoP! see as a truth about the New York City comedy community: that it tends to be predominantly white, and that that is reflected in its audiences. The group has had to consider who is in the audience and what they find funny, “and find the balance between pushing it, but also like being accepted by it, too,” said Ann Marie “Competitive Rice” Yoo, who represents South Korea in the show. Another part of the 20-minute show digs into more of the nuances of the Asian-American experience — such as inter-ethnic tensions that exist between various Asian countries. 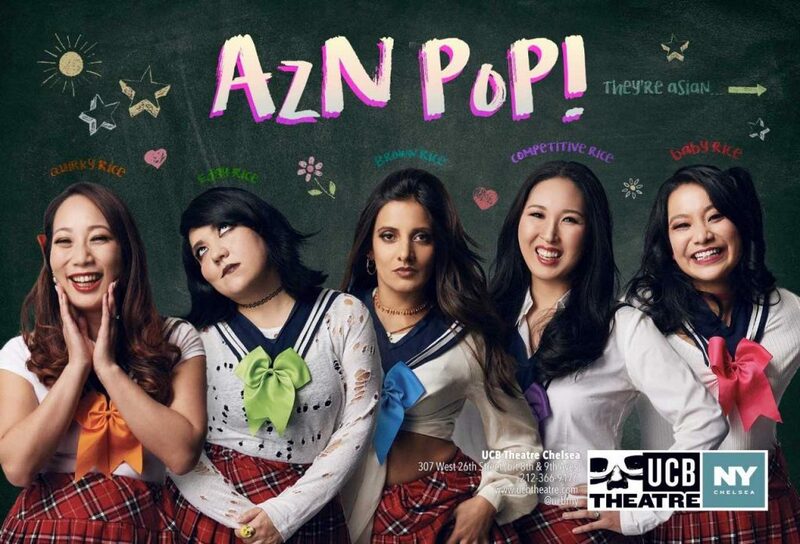 AzN PoP!’s next performance will be at Upright Citizens Brigade Chelsea Theatre on August 9th. It will also perform at the UCBT in Los Angeles this fall.